Take my book for free. I want you to share it. I want it do more good in the world. 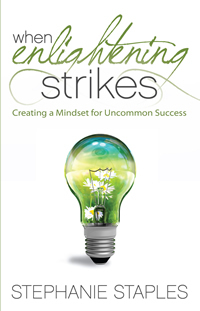 It’s called When Enlightening Strikes – Creating a Mindset for Uncommon Success and if I did my job correctly you will laugh and feel and learn. Go here and use this code…kiwi-livewell. No strings attached. Of course you can’t get it signed this way but hey, free is free. If you would like a signed copy, you can scoop one up here and a personalized paperback will be delivered to your door! Just enjoy it and if you are interested, join our community of like-minded people who are making themselves better people and making the world a better place. Stephanie Staples, CSP is a catalyst for positive change across North America. When your team, association or company is ready to grow, let her know. This entry was posted in Blog, Happiness, Health, Personal Growth, Positivity, Relationships, Wellness, Work/Life Balance and tagged Stephanie Staples, Your Life Unlimited. Bookmark the permalink. I would like your free book. Thanks a bunch. I really like the layout of this web page. Very open, fresh feel to it. Previous Previous post: There I am, being human again.